Having been passionate about animals and their care since an early age, Kelly Jane undertook to establish a home business in pet grooming. Kelly's Pretty Pets works with dogs and cats, and offers transport for those who cannot bring the animals to Kelly's home. She began her undertaking by enrolling in a training course. 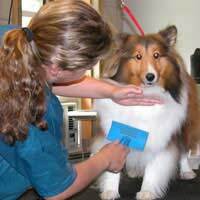 This is extremely important in order to establish the professionalism of a pet groomer. Kelly began her business rather informally, by grooming the pets of her friends and acquaintances. Soon she had enough funding for more formal advertising, both in newspapers, magazines, and the Internet. Her business grew steadily, and she began to expand her business to the pet product industry. In addition to pet grooming, she now offers a variety of products for pets. These can be bought from her website or at her home, where she conducts her grooming business. Within a year, Kelly's business was profitable enough to allow her to quit her day job and employ two assistants. She is very happy with her business, and finds it extremely rewarding. She said: "Although it is very hard work, the rewards far outweigh any drawbacks; there is nothing better than seeing a well-groomed pet." The pet grooming industry is both profitable and resilient, which is particularly relevant during the recession. Pet owners tend to take the well-being of their animals very seriously, and are willing to pay for services that ensure this. Although the recession may result in spending less on non-essentials, there will always be pet owners who require grooming services. The target market for Kelly's business is mostly dog owners, although there are some cat breeds that also require grooming. People who invest most in regular pet grooming are those who own dog and cat breeds such as poodles or Persians. There are also owners of non-bred animals who prefer the professional care of an animal groomer rather than attempting to do this themselves. There are no great entry barriers to the pet grooming market. The main requirement of professionalism is to be trained and certified. Kelly's first strategy to handle competition was to provide competitive pricing as well as strategies such as a free gift for every five groomings. She also diversified her service by adding products on her premises and online. Her website includes relevant and interesting pet information, as well as a community area where visitors can talk about their pet and grooming issues. Kelly began promoting her business informally, inviting colleagues and friends to bring their dogs for grooming. She also offered a discount for first-time clients. When the business began to grow, she invested more formal advertising, and included strategies such as free gifts for every five groomings. Kelly operated the business from her home, and began with herself as the only manager and employee. The business grew profitable enough to require the services of two more employees, one to handle administration and the other to help with the practical aspects of pet grooming. For her business equipment, Kelly approached Mutney's Grooming Supplies, which offers starter packs from £800. She also inherited a considerable amount of equipment from her parents, who had a grooming business before they retired. The total amount needed to start the business came to about £2,000. Currently, Kelly's business continues to grow. She will soon employ a further two assistants. She also plans to begin a training venture for future animal groomers.